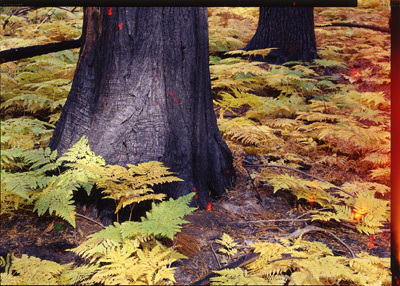 Since my desire is to reproduce the entire spectrum of natural light, I use panchromatic films almost exclusively. I am partial to the use of fine grain films, ISO 25 - 125, as I prefer their smooth tonalities to that of faster films. Truth be told, some slower, fine grained films are no better - and occasionally worse than faster films in some formats. I prefer straight grain films over tabular grained films (Kodak TMAX, Ilford Delta) whose design is in part intended to mask grain. I have not found other monochromatic films (infrared, orthochromatic, etc.) to yield results any more compelling for my interests than those of color films. Here are some observations of many of the films I have used (some of these films may no longer be available - R.I.P.). FP4+ is my go-to, fine grain, slow LF film for most shooting whenever stopping motion or low light conditions are not an issue (though the wind frequently makes stopping motion an issue). It has beautifully smooth tonalities when exposed correctly in good light and can make enlargements as big as desirable in my lab. I presently mix FP4+ with existing stocks of Arista Pro 125, as the Arista is (apparently) rebadged FP4+, discounted by Freestyle Photographic. I shoot both of these films at 100 as my film testing indicated this is close enough (and easier to figure) to the tested speed of 80 for my natural lighting conditions. HP5+ is my current favorite "medium grain" fast LF film. It seems to have a subtly tighter grain structure and a bit more contrast than TXP 320. Although I shoot both films at my tested speed of 200, the reality is that I only gain one stop by using these films in preference to FP4+. My previous "high speed" film of choice, I use TXP interchangeably with HP5+, shot at 200. I have tried several developers with TMAX and have found the results to be less than compelling, particularly in big enlargements. The resulting prints can for the most part be described to as "mushy", the tabular style grains (i.e., the 'T' in TMAX) probably being responsible. I never finished up my original box of this film. Cut from 8X10 sheets, this film never delivered the kind of prints possible with its roll film (120 and 135) equivalents, no matter how little grain. A beautiful film, which unfortunately has a much more prominent grain than its speed of 200 (shot at 100) would otherwise indicate, even when a staining developer like pyro is used. In fact, the grain seems to hold no advantage over Ilford and Kodak's 400 speed films. I do think it would make a fine studio film when utilized in portraits, in controlled light. Quite contrasty and harsh, in my estimation. This film just doesn't seem to match the characteristics I desire in other slow speed, fine grained roll films. It also suffers the fate of all Eastern European films in that quality control is very poor. The former Freestyle Photographic equivalent of Ilford FP4+, see above. The former Freestyle Photographic equivalent of Bergger BPF, see above. 120 films may be exposed in many formats from 645 to a square 6X6 to a panoramic 6X17, depending on the camera. 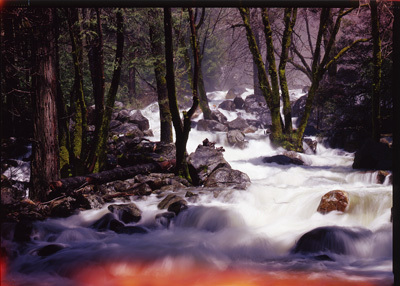 I prefer 6X7 as it maximizes the amount of film exposed and its format is that of a conventional 4X5 aspect ratio. The following observations of 120 film are based upon 6X7 exposures. I don't use 220 films (twice the length of 120, allowing double the number of exposures) as I use an abridged version of the Zone System to plan exposures and make prints - meaning fewer exposures to differ in zones of expansion or contraction. 220 may also wreak havoc with a camera's pressure plate, affecting film flatness. I process all roll film in Hewes stainless steel tanks and reels. My absolute favorite 120 film. Developed in Rodinal it is the epitome of sharpness (acutance) and smooth tonalities. Given uncompromising lenses and technique, prints up to 20"X24" are nearly grainless and selected negatives may be enlarged up to 30"X40". I bought out the local supplies of this film in the early 2000's after Agfa stopped its manufacture. As of June 2010, I have 3 rolls left. I am saving them for special High Sierra shooting this year. Given proper development in Kodak's Technidol, TP produces beautiful, grainless negatives. Uneven development can result in unprintable skies. It was notable for its extended red sensitivity. It is no longer manufactured. TMAX developed in TMAX RS has given me good results in prints. Most subjects max out much past 20"X24". I prefer PMK Pyro to Rodinal for its development. It also exhibits all of the unfortunate problems of the MACO films. At this juncture it is the best of some rather poor options currently available for 25 speed 120 films. The reality is that in order to keep shooting with it, I must backup every shot with an identical frame in order to be even casually certain that I have landed upon a decent patch of film. 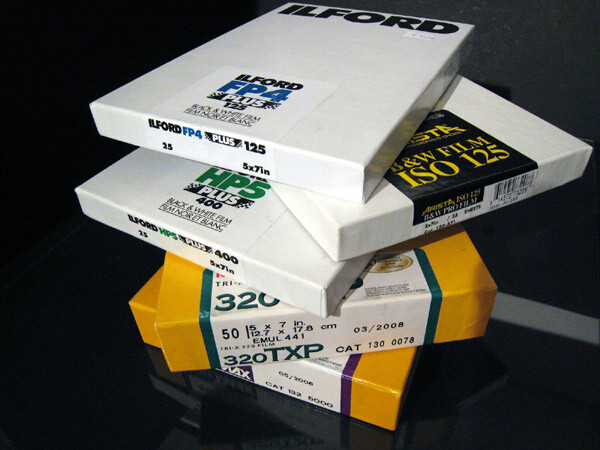 Halving the amount of frames per roll means that this film is at least six times more expensive to use than other films the 25 - 100 speed range (slow films). MACO films were available (as MACO) for only a short period of time. One roll, developed in Rodinal, would give spectacular results - similar to Agfapan APX 25. The next roll, processed identically, could be literally peppered with pinholes. At least it was reasonably inexpensive when sold as the Eastern European MACO. Even using several developers, I was never able to tame the contrast in this film to my liking. The quality of this film is typical Eastern European. Although I love this film in 135 format (35mm), I have dabbled with it only occasionally in 120. I feel it is a bit too contrasty and the grain not terribly fine for a slow film, at least when processed in Rodinal. I do however get generally agreeable results when developed in PMK Pyro. This good quality medium-size grain Japanese film has not held up well to enlargements above 11"X14" (i.e, my smallest enlargements) when developed in Pyrocat HD or Rodinal. While I haven't shot 35mm in some 10 years, the following is a partial list of films I recall using. These films all share identical characteristics with their 120 brethren. It is nearly impossible to make fine art prints much larger than 16"X20" with small format, even given the finest grain film, the best lenses, and the best technique. Enlarging beyond 16"X20" isn't only a matter of pronounced grain, but smooth tonal areas "pull" apart distressingly, in much the same manner as dried paint on an expanding balloon. Freestyle Photographic stocks many itinerant Eastern European, Russian, and Chinese 35mm films. If this film and its recommended Technidol developer can still be found it may be the only way to make decent 16"X20" prints from 35mm cameras. Plus-X is a solid general use film covering a wide variety of shooting conditions. TMAX was intended to be the replacement for Plus-X. The results are similar if you don't mind its tabular grain structure. I cannot ever recall shooting APX 25 in 35mm, but I have several rolls in my freezer. If I ever need to use my SLR, I will certainly use my cache of this film first. Pan F is a very solid performer in any format. All of the characteristics noted for large format films are contingent upon the type and method of developer. I have tested most commercially available developers and found that for my purposes, the smallest grain structures, smoothest tonalities, and best acutance are achieved with PMK Pyro. If I could obtain equivalent results, I would rather use Rodinal for all my developing, as I have found it difficult to judge Pyro negatives as to their potential to make fine art prints until they have been proofed. I tray develop all films. Using a wire basket to prevent scratching, I am able to process two 5X7 sheets at a time in 11X14 trays. Large format (sheet) films are packed in triple nesting boxes that are often incorrectly assumed to be "light proof". Even boxes made with black inner boxes can be suspect. I mention this here because this was the source of much consternation until finally resolved. Although I had never experienced any problems with monochrome films, light flares appeared sporadically on color transparencies over time. At first, this was almost certainly caused by the commercial lab that developed the film, as I don't develop color myself. But the lab in question (one of the few remaining labs willing to develop large format color film) placed the blame on lens/camera flare or bellows leaks. After performing light leak tests and inspecting the camera lenses and film holders several times over a period of more than a year, nothing was found to indicate the camera was at fault. I had even taken simultaneous shots using monochrome and color films (i.e., Fuji Provia, Kodak Ektachrome) in the same film holder, resulting in a perfect negative and a light damaged transparency. I finally sent the camera to Keith Canham (Canham Cameras) for his help. It was returned with a clean bill of health. What was the difference? I develop my own monochrome films, but the lab develops my (infrequent) color films... got to be the lab! Keith assisted me in assessing my workflow objectively as I processed my own film and had film processed for me. Upon removing exposed film from their holders, I place the film in extra film boxes, marked for processing. While black and white either stays in its holder or is placed in a box until I get home, color eventually goes into separate box, for later transport to the lab. I was finally able to confirm that it was in the process of transport to the commercial lab that the color film was being compromised. The transport box was tossed, rubber banded, onto the rear seat of my vehicle, occasionally exposed to direct sunlight through the car windows. This factory–made, triple nesting box, was not lightproof to direct sunlight. I can't say whether the monochrome film wasn't also exposed to direct sun, although it very likely was - careful as I might be, as I frequently work in strong sunlight. 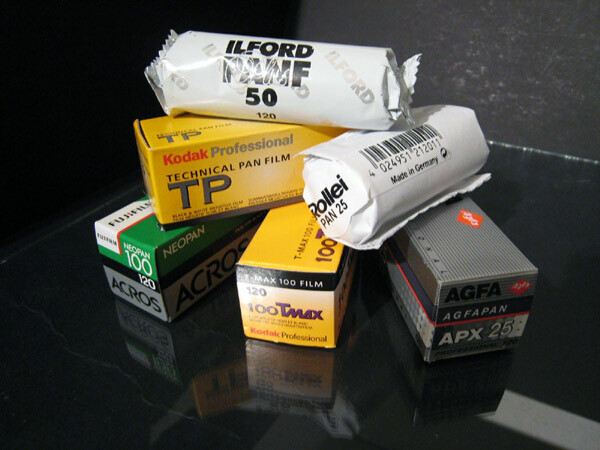 It is possible that the particular boxes used for monochrome transport were light proof, or that the film itself is not as sensitive as color, or that transport for processing wasn't an issue. In any case, the solution was to tape up the two inner boxes to make certain that they are lightproof (I used gaffers tape). I have taken the precaution of doing this for all my transport (i.e., EXPOSED) boxes - including monochrome. Problem solved. While not for the timid, cutting film to size can be economical, as well as sometimes necessary to obtain sheets of the correct size for your film holders. Because it tends to be a stressful experience, can introduce dust/scratches, and can be wasteful, I rarely do it. Much better to find factory made and cut films to work with if at all possible - and buy a freezer for film storage. But it may be the only practical way of obtaining odd sizes of film from larger sheets more commonly available, or of utilizing out-dated films bought on the cheap. I have cut both 8X10 Kodak Technical Pan and expired Ektachrome 100 VS into 5X7 sheets successfully. I use my large Rotatrim roll cutter to make accurate cuts by placing stops (with painters tape) for the appropriate sizes. I then practice on sheet paper to make sure everything is OK before shutting off the lights to do the real thing blind - in the dark. As it will be unlikely that I.D. notches will remain on any portion of the cut films, I make sure that they are stacked (with interleaving tissue) face up in the innermost box, so that that they are certain to be inserted emulsion side out in the film holders. As large, stable film manufacturers reduce their stock, choices, or become insolvent, some Eastern European and Chinese film coating facilities have taken up the slack. The quality control of these films is consistently and predictably poor. And by poor, I refer to holes, flaking and scratches in the emulsion. Many of these emulsions claim to be soft, requiring hardeners, and other special handling. I am a careful worker (if you doubt that, I invite you to see my actual prints), and no amount of diligence or procedure has been able to overcome these manufacturing defects. Some of these defects may be unnoticeable in studio work and produce fine results, but most assuredly, if there is a pinhole or a scratch on my negative it is certain to end up not in a bush or rock but in my beloved skies. The best advice to live by is to stick with one or two films, learning their ins and outs completely before searching for that "magic bullet". Unfortunately, these days, as films disappear ever more swiftly from the marketplace (always my favorites, it seems), this is advice that can be difficult to live with. I can say with absolute certainty that I have had superior results from which fine art prints were made with all films. For me, finding good films is a matter of reliability, ease of use, and maximum potential enlargement capability. No film, no matter how "bombproof" will make a fine art print without the talent of the photographer to visualize and compose - and the discipline to expose and ultimately to execute their darkroom prowess. Presently, it seems to be a waste of time for me to risk shooting anything other than good quality Ilford and Kodak films in large format, or to develop in anything other than PMK Pyro. 120 films are a different story. I must continue to test and junk many otherwise good negatives until the quality of the present crop of medium format films improves. I have exposed way too much film only for the purposes of testing. I am neither a technophile nor gearhead, but I am a scientist by training and understand the necessity of consistent and organized methods to get superior results. As an artist concerned primarily with making fine art prints, I consider film testing a necessary evil - wasteful of time and resources. Frankly, the never-ending testing and re-testing of poor quality slow speed films is simply killing my spirit. Though it pains me to say this, the inevitable solution may be to shoot digital, make an internegative from the file, and print that.